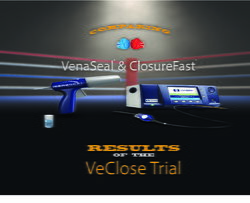 VeClose is the prospective, multicenter randomized controlled U.S. pivotal trial comparing cyanoacrylate adhesive (VenaSeal®, Medtronic/Covidien, Minneapolis, Minnesota) to radiofrequency thermal ablation (ClosureFast®, Medtronic/Covidien, Minneapolis, Minnesota) for non-inferiority in closure of incompetent great saphenous veins (GSV). Two-hundred forty-two patients were enrolled in this clinical trial, the first 20 of whom were roll-ins for training of the investigation site personnel and not included in data analysis reports. Enrollment took place between March and September of 2013, with follow up visits continuing through September 2016. Site selection was designed to include 10 free-standing vein centers (no hospital sites) with 16 investigators and individual registered vascular sonographers (RVT) already quite experienced with RFA. Practitioners were chosen to represent a variety of training backgrounds, including general and vascular surgery, cardiothoracic surgery, dermatology, interventional radiology, cardiology, and vascular medicine. None of the principle investigators at the sites were stockholders for Sapheon Inc (original owners and developers of VenaSeal® - since acquired by Medtronic/Covidien). All of the diagnostic and therapeutic ultrasound involvement was performed by an RVT, each qualified by a third-party independent assessment group, and all ultrasound images were overseen and judged by an independent core vascular laboratory for the three-month follow-up exams. Additionally, rigorous on-site and remote monitoring was utilized throughout the study. Of the 222 patients being studied, 108 were treated with Venaseal® (VS) and 114 were randomized to receive the Venefit® radiofrequency ablation procedure (RFA). To avoid confounders in the data analysis early in the study, adjunctive treatment such as phlebectomy and/or sclerotherapy was not allowed until after the three-month follow up visit. 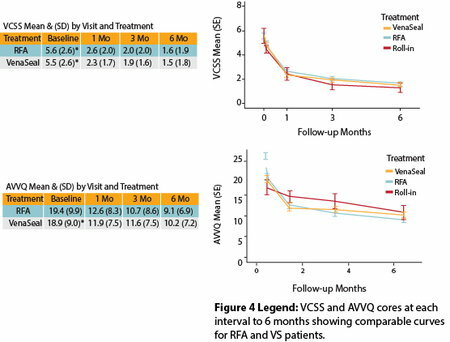 The primary endpoint of the study was non-inferiority of VS compared to RFA with respect to GSV closure. Study subjects were 21-70 years of age with symptomatic varicosities (CEAP clinical class C2-C4b) with GSV reflux >0.5sec documented by duplex in the standing position. Exclusion criteria included significant reflux in the ipsilateral small saphenous vein (SSV) or anterior accessory saphenous vein (AASV), prior treatment of the target GSV, significant arterial disease, a history of venous thromboembolic event (VTE), or aneurysmal dilation of the target GSV >12mm. Patients had an initial thorough bilateral duplex examination and evaluations including CEAP classification, as well as physician and patient-reported outcome measures including Venous Clinical Severity Score (VCSS), EuroQOL-5D (EQ-5D) generic quality-of-life scale, and a disease-specific quality-of-life questionnaire – Aberdeen Varicose Vein Questionnaire (AVVQ). 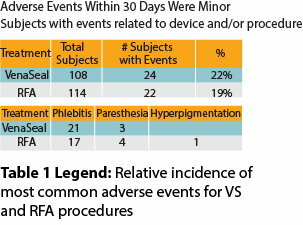 Patients were randomized 1:1 to receive either the RFA or VS procedure. All investigators were current and experienced RFA users, and RFA procedures were performed according to the manufacturer’s standard instructions using tumescent anesthesia. Neither oral nor intravenous sedation was allowed by protocol. Following the roll-in training on two patients at each site, the VS procedure was performed in a standard manner without the need for tumescent anesthesia. Briefly, a 5-F catheter was inserted percutaneously under ultrasound guidance and advanced to 5 cm caudal to the saphenofemoral junction (SFJ). With proximal compression of the SFJ using the ultrasound probe, 0.1mL of cyanoacrylate adhesive (CA) was injected followed by another 0.1mL of CA 1cm inferior to the first injection site. (Figure 1) Compression was maintained for three minutes, whereupon further injections of 0.1mL at 3 cm intervals were made along the length of the treatment segment, with 30 seconds of compression at each site. Patients were instructed to take over-the-counter analgesic medication only if needed. Immediately after venous access patients were asked to rate their pain experience on a scale of 0-10 (0=no pain, 10=worst imaginable pain). Following completion of the primary procedure patients again rated their pain experience for the entire procedure, excluding pain on access. The patients were discharged immediately from the site with compression hose as a protocol requirement following both procedures for a period of one week. Patients returned to study sites at day three for a clinical assessment including use of analgesics, and the investigator’s assessment of the presence of ecchymosis, rated on a 0-5 point graded scale (0 = none, 1 = involving <25% of the treatment area, 2 = 25-50%, 3 = 50-75%, 4 = 75-100%, 5 = extension above or below the treatment segment). Patients then returned at one-month and three-month intervals for more extensive evaluation to include queries about adverse events (AEs), CEAP classification, VCSS, AVVQ, and EQ-5D assessments. Following the three-month visit patients were allowed to have adjunctive treatment, typically ambulatory phlebectomy and/or ultrasound-guided foam sclerotherapy for varices and remaining incompetent veins. Early results of the VeClose trial have been reported1, with one-year data to be reported at the International Union of Phlebology Chapter meeting in Seoul, South Korea August 28, and during the American College of Phlebology Annual Congress in Orlando, Florida in November. The report of the one-year data to the FDA resulted in approval for use early in 2015. Follow up is currently being conducted for patients in the study at the two-year interval and will continue to three years. The primary endpoint for the VeClose trial was complete closure of the treated GSV segment. Duplex ultrasound (including compression, color flow, and pulsed Doppler) was used to determine whether any patent segment greater than 5cms in length was present. All images were independently evaluated by a core vascular laboratory. Successful achievement of the primary endpoint was to be confirmed if the proportion of subjects with complete closure with CAE was statistically non-inferior to that with RFA, with a 10% non-inferiority margin. Secondary endpoints were pain experienced during the procedures and degree of ecchymosis at day three. Also measured were changes from baseline in the VCSS, AVVQ, EQ-5D scores, and comparison of rates of AEs. Subjects enrolled were predominantly CEAP class 2-3 Caucasian women with complaints of pain and aching. Baseline characteristics were similar between the two groups. All subjects received their assigned procedure. The average GSV diameter was 6 mm and average treatment length was approximately 34cm, not significantly different in either group. Treatment time was slightly longer for the VS group, most likely related to familiarity level with the two procedures. 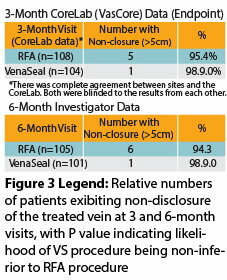 Pain scores during venous access were similar, and somewhat surprisingly pain scores during the rest of the procedure, including instillation of tumescent anesthesia in the RFA group, were almost identical in the two groups. Three severe AEs were seen (breast cancer, ureteral calculus, symptomatic orthostatic hypotension), none of which were considered to be related to the AVVQ, and EQ-5D were nearly identical for the two groups at each time interval out to six months. (Figure 4) No device or procedure. 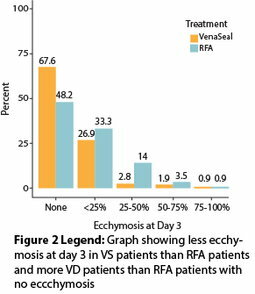 This study clearly demonstrates non-inferiority of efficacy of the VS procedure compared to the RFA procedure in the short term. One interesting sidelight of this study was related to adjunctive treatment. Phlebectomy and ultrasound guided foam sclerotherapy was not allowed until after the three-month follow up visit. Investigators were asked to predict if phlebectomy would still be required at the three-month interval, and if so how many incisions would be necessary. Interestingly, as has been previously reported, fewer patients required phlebectomy than had been predicted, and fewer than predicted incisions were also required. Prior to the study it was assumed by most investigators that pain scores after the venous access, but during the procedure, would be higher in the RFA group because of the necessity of tumescent anesthesia. This proved not to be the case even though it is obvious to anyone involved in thermal ablation procedures that the most painful part of the procedure is instillation of the tumescent anesthesia. In two previous studies of the VS procedure, compression hose were not used as a necessary component of post-treatment therapy.2,3 In the VeClose study, to properly compare the RFA to the VS procedure, compression hose were mandated by the protocol approved by the FDA, since compression is a standard recommendation with the RFA procedure. Further studies will be required to confirm early results demonstrating that compression is unnecessary following the VS procedure. The VeClose randomized control trial suggests that in the short term (six months) the VenaSeal® procedure is not inferior to the Venefit® procedure with respect to occlusion rates and quality-of-life scores, and may be superior to the Venefit® procedure in the degree of post-procedural ecchymosis. One-year results will be published soon and the study will continue to its three-year conclusion to provide more perspective from longer-term results. Further studies will be needed to confirm successful closure as well as to demonstrate other advantages of the VenaSeal® procedure, such as lack of necessity for post-procedural compression and any additional benefits of this non-tumescent technique. The future of ablative venous therapy appears to be in favor of less invasive modalities, among them non-thermal, non-tumescent procedures such as the VenaSeal® procedure. 1 Morrison N, Gibson K, McEnroe S, Goldman M, King T, Weiss R, Cher D, Jones A. Randomized trial comparing cyanoacrylate embolization and radiofrequency ablation for incompetent great saphenous veins (VeClose) J. Vasc Surg 2015;61:985-94. 2 Almeida JI, Javier JJ, Mackay E, Bautista C, Proebstle TM. 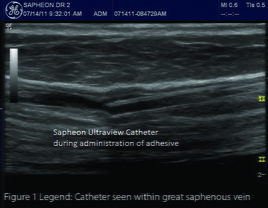 First human use of cyanoacrylate adhesive for treatment of saphenous vein incompetence. J Vasc Surg Venous Lymphat Disord 2013;1:174-80. 3 Proebstle TM, Alm J, Dimitri S, Rasmussen L, Whiteley M, Lawson J, Davies A. Twelve-month follow-up of the European multicenter study on cyanoacrylate embolization of incompetent great saphenous veins [Abstract]. J Vasc Surg: Venous and Lym Dis 2014;2:105-6. Does Fiber Tip Affect Treatment with a 1470 nm Diode Laser?